Yes, as you've probably noticed September is Aztec month in Rhythms magazine. But if it's one thing we love doing in Rhythms it's championing underground Australian music especially that which may have been lost in the past and helps us piece together our own current musical identity. And Aztec's dedication to such deserves to be acknowledged. 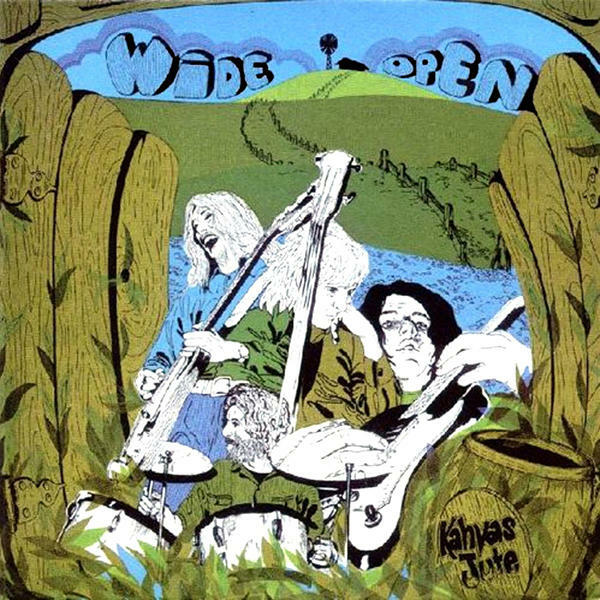 So here we are with yet another invaluable and highly-regarded slice of '70s Australian psych-rock in Kahvas Jute's Wide Open. Kahvas Jute emerged from the late-60's haze of pot smoke, very much influenced by the greove-based early psych of Hendrix and Cream and the beginnings of Led Zeppelin's powerful dynamics. The band united the talents of Dennis Wilson and Bob Daisley of Sydney outfit Mecca with Taman Shud's Dannie Davidson and Tim Gaze. And considerable talents they are - here were four musicians who could take it to their heroes in terms of chops. Wilson and Gaze both evidently influenced by Jimmy Page, weave around each other in harmonic and rhythmic webs. But what really makes Kahvas Jute stand out to my ears is Dalsley's incredible bass playing. Rhythmic and solid but also incredibly melodic and adventurous, Daisley's bass runs lift Wide Open's music into a stratosphere that matches the quality of their influences - all of whom have been etched into the annals of rock as the greatest artists of all time. Unfortunately, Kahvas Jute did not end up in those annals, but Daisley did go on to establish an illustrious career, playing with Ritchie Blackmore's Rainbow, Uriah Heep, Gary Moore and Ozzie Osbourne, co-writing some of Ozzie's signature tunes. Like many of their peers, Kahvas Jute deserved to be world-famous - whether swinging and soaring with the Zeppelin-like proto-power of 'She's so Hard To Shake' or exploring more folk influenced areas as on 'Twenty Three' and 'Ascend', Wide Open is an amazing body of work. This re-release comes with five live bonus tracks from a 2005 reunion show.